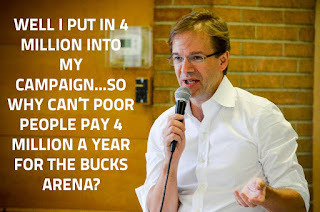 Cognitive Dissidence: Abele: Make The Poor Pay For Bucks Arena! Last summer, Scott Walker and his little mini-me, the plutocrat and Milwaukee County Emperor Executive Chris Abele, wanted to help build a new Bucks arena. Even though the new owners are worth more than $5 billion, Walker and Abele promised that the taxpayers would pay for half of the arena. When this plan appeared to be dead in the water, in comes Milwaukee County Executive Chris Abele, a plutocrat who just happened to buy a $2 million condo next to the proposed development site, with an even worse idea. Abele's plan is to increase the county's share of the cost by handing over cases of uncollected taxes and court fines to mercenary debt collection agencies, who would add 15% to the money they collect from already indigent people. On top of that, Abele would sell county-owned land worth $9 million to the Bucks owners for a buck. Even with Abele promising to stick it to his poorest constituents, Walker and the Republicans couldn't come up with enough votes to get the deal passed. So the Republicans did something that was almost unheard of in Wisconsin - they reached across the aisle to ask the Democrats for their help. To get enough Democrats to vote for this bill, State Senator Chris Larson got everyone to agree to take out the part about sticking it to the poor. Thanks to Abele, Milwaukee County was still on the hook for $4 million per year for 20 years for the arena, but it did not have to be built squarely on the backs of the poor. Now fast forward to this past Friday. 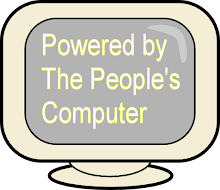 Abele paid off a couple of Republican and a couple of Democratic state legislators to reintroduce that portion of the deal. But this time, he made it even worse by making the burden on the poor $5 million per year instead of the previous $4 million. Not only did Abele stick it to the poor even more, but he had the legislators rush the bill through as fast as they can. He did this partially because this is the last week the state legislature is in session - for the rest of the frickin' year. Abele also had the bill rushed through because he might not be in office long enough to see it through otherwise. Abele is up for reelection this year and is facing a very strong opponent in Larson, the same guy that fixed the Bucks deal last year. In fact, Larson pulled an upset victory over Abele, who had outspent Larson by more than a 20-1 margin. I really don't know how Abele thinks that attacking his own constituents is going to help his chances. Then again, Abele, who is willing to spend more than $5 million of his own money in an effort to buy his reelection, probably doesn't care. abele paid people off? 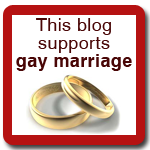 do you,have evidence of this accusation?